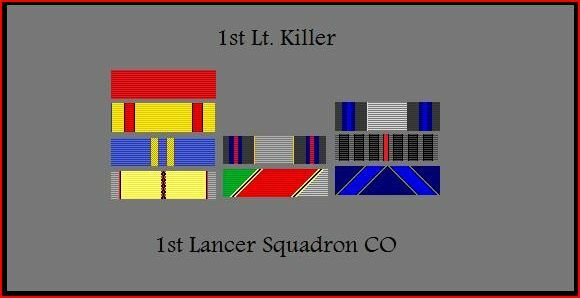 1st Lt. Killer Served in the war for freedom against ACC, and vRCAF. Acheived 3 Air - Air kills against ACC. Bombed the vCRAF base in cold lake. Bombed ACC postitions in Iraq. Helped defend the Carolinas from capture during while ASPL captured South Carolina. Defended Germany from vRCAF while under FSXL command. Served in many cargo missions during and post war. Including the GPEO migrations out of North America and into South America. Commmanding officer and instructor of the GPEO bombers, including the 1st. Lancer Squadron. Which includes the pilots, Spartacus, and MC Sics. Led the Liberation of North Korea, the United Arab Emrites, Pakistan, and North Carolina, in operation "RollField". With GPEO, and FSXAF members. Ahh, Killer your ribbons are all fuked up, lol !